This afternoon my door bell rang and I was delivered a package which came from Sleeping Bear Press. I stood on the porch and opened it up to discover this beautiful gem of a book and I just had to tell you about it right away! I think this book is a bit more unique than some of the other titles that come out of Sleeping Bear Press because it tells the story of one particular family. From A to Z we pick up facts about the famous Von Trapp Family Singers. I was also very impressed that, despite the fact that the book works through the alphabet, author William Anderson does a marvelous job telling their story chronologically, beginning with A is for Austria. We learn about the Von Trapp family's home country and the Captain with his first wife. As we move through the alphabet we learn about the scarlet fever that took the life of the children's mama and how Maria came into the family home. I really appreciated the way that Anderson gives us snippets of facts strung together in a story-telling manner. 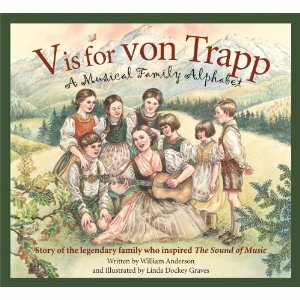 S, as you might suspect, is for The Sound of Music and in V is for Von Trapp: A Musical Family Alphabet they talk about the movie and the family's reaction to the depiction of their family. Truly, this is a marvelous book and I highly, highly, highly recommend it to any fans (or friends of fans) of the movie The Sound of Music. (Can you say "Christmas List" anyone?) This book put such a huge smile on my face this afternoon and I'm exited to see it! THANKS, Sleeping Bear Press, for giving us such a lovely book to enjoy a piece of musical history with. I so look forward to sharing this title with my kids in the years to come. Aw! I just love your excitement! To be honest (forgive me, please!) I have only seen the movie a couple of times, but I want it...and it's on my Christmas list. I lived for too many years in the "heart" of all things Bavarian with the play being produced every summer and I played in the pit orchestra for it for 2 summers. I canNOT listen to that music ever. This is my sister's favorite family. I bet she would love the book. Oh, how I wish my daughters were younger when I see a book like this! We watched 'The Sound of Music' together this summer and it had a huge impact. I love these books from Sleeping Bear Press. We have several of them - but not this particular one - which looks like one I'd love! This sounds like a great book! I'll have to look for a copy. Thanks for the review! What a fun book!! The family (now grandchildren and greats) lives in New England and tours. We watched the movie last year with our kids and they enjoyed it. The singing really got their attention.